Hunting topographical features can be highly effective during the rut as bucks are covering lots of ground in search of does. While cruising, bucks will always choose the path of least resistance as long as it offers safety and connects things they want (i.e. does or doe bedding areas). In hill country that means they will use topography heavily in their travel. Because hunting topography can be somewhat tricky at first, here are four topographical features with examples to get you started! Saddles are simply the lowest point along a ridge line, between two ridges, or between two hills. They act as an easy corridor for bucks crossing from one side of a ridge or line of hills to the other without having to climb to the highest point. Deer will often cross through the saddle perpendicular to the ridge line, travel parallel down the ridge line, or work down the ridge on one side and then make a big loop through the saddle and head back the direction they came from but on the opposite side of the ridge. (Above) The saddle in the example is created by two high ridges on the West and East connected by a low spot in between. Red travel routes are deer crossing over the ridgeline through the saddle. The blue line are deer traveling parallel to the ridge and the green line are deer looping around the ridge through the saddle. Ridges are found across all states and may vary from 500’+ elevation differences in West Virginia to subtler 6” elevation differences in bottomland hardwoods in Mississippi. Ridges are used as travel ways and sometimes barriers by deer. Deer will generally not walk down the top of a ridge but will instead travel along the ridge a third or quarter of the way down, usually on the downwind side. This is likely a strategy to avoid being sky-lined to predators. In the case of cruising bucks, this allows them to smell the whole upwind side of the ridge while visually observing the downwind side. Near the ends of ridges where they turn into points you will see deer trails converging and following the most gradual incline down the point. Hunt on the downwind side of the ridge just below where you predict deer to travel, this way you will be downwind of their travel route and will still be able to observe the upper part of the ridge above the deer trail. (Above) The ridge in the example runs North to South and ends in a point on the South end. 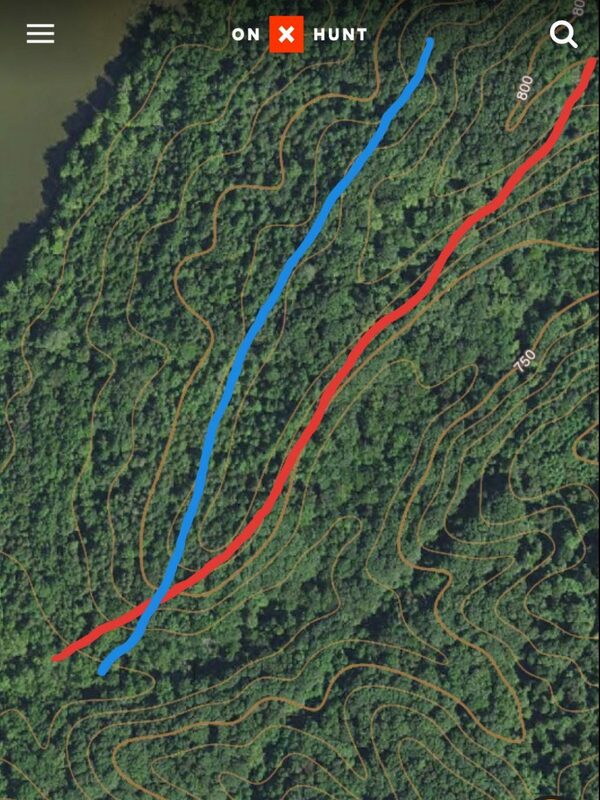 Lines indicate deer traffic running parallel along the ridge on either a West wind (red line) or an East wind (blue line), most traffic will converge halfway or so down the point of the ridge. Think of a spur as a long ridge line with many short small ridges trailing off perpendicular to the main ridge. These features serve as barriers to deer travel, but can make awesome funnels! Deer will travel either along the top or the bottom of these features parallel to the main ridgeline. During mornings deer will likely travel along the top of these features so they can smell everything below them on the morning thermals. In the evening deer are more likely to travel the bottom and use dropping evening thermals to smell everything above them. 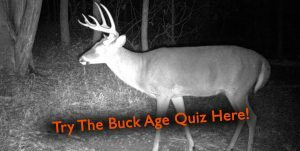 You should likewise hunt high in the mornings and low in the evenings around these features to avoid being winded and put yourself in range of a cruising buck! (Above) The spurs in the example are created by several small ridges running East/West off the main ridge top to the East. Lines indicated deer travel avoiding the steep elevation changes of the spurs. Deer will likely travel the bottom (blue line) on East winds or during evening thermals, and will travel along the top (red line) on West winds or during morning thermals. There are two main types of ridge hubs, those created on the top of the convergence of several ridges and those created in a bottom where the tips of several ridges converge at a low elevation. Hubs will have a wheel spoke appearance with ridges coming from all directions. Because of the multitude of directions for deer traffic, these features can be particularly tough to hunt without being winded. Use thermals, wind direction, and careful entry routes through drainages to hunt these features without being busted. (Above) The hub in this example is created by several small ridge points converging in a valley. 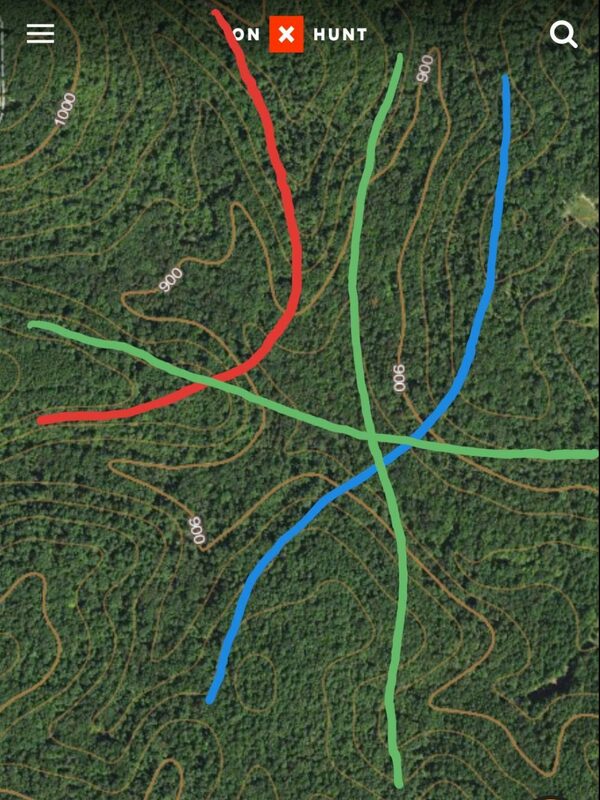 Red and blue lines indicated deer traffic crossing from point to point across valley. 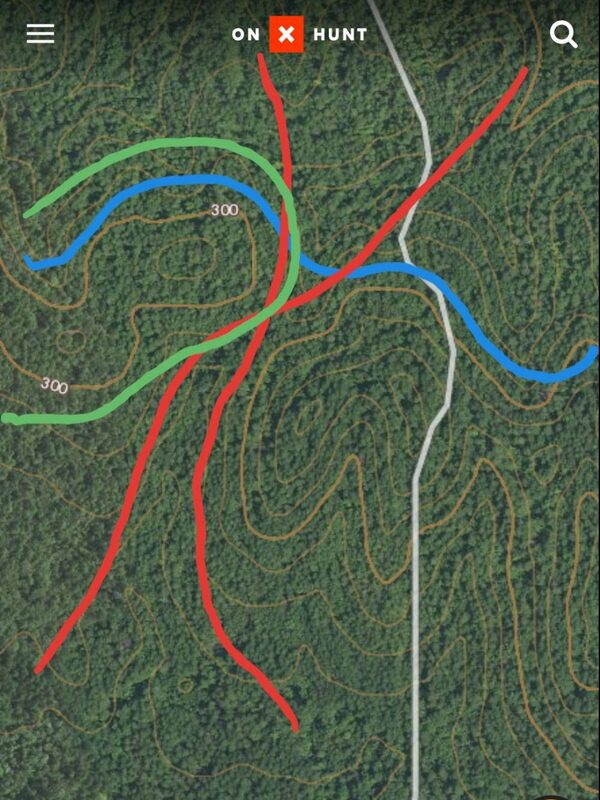 Green lines indicated deer traveling down valley and/or from ridge to ridge. Often hunters are intimidated by topography and stand choices based solely on these land features. But with the use of a handy mobile mapping app, like onX used for the examples, you can easily identify topography features and hunt them. I will guarantee that once you begin hunting topography and are successful doing so, there will be no other type of habitat characteristic or scouting skill that will be as personally rewarding when it works. 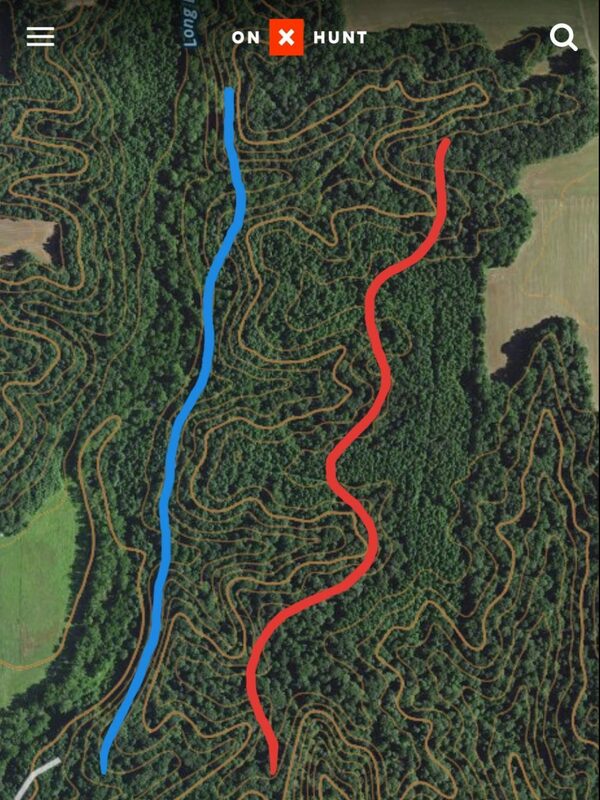 Predicting and later seeing deer travel based on topography is very fun, especially during the rut when you are likely to catch a cruising buck in one of these features!